5 things only an aunty would know | ♡ Memorable life, take a picture! I currently have 2 nieces and 1 nephew, Chid, Airis and Iman. They are basically toddlers now, with only few vocabs they mastered which are found in the dictionary. The rest are just words they made up or words that exist but because they were mostly baby talk, you still do not understand them. However, even when they are just talking gibberish, I still think they are the most adorable babies in the world. And I don't care what others say. Your opinion is not needed in this matter. Thank you. 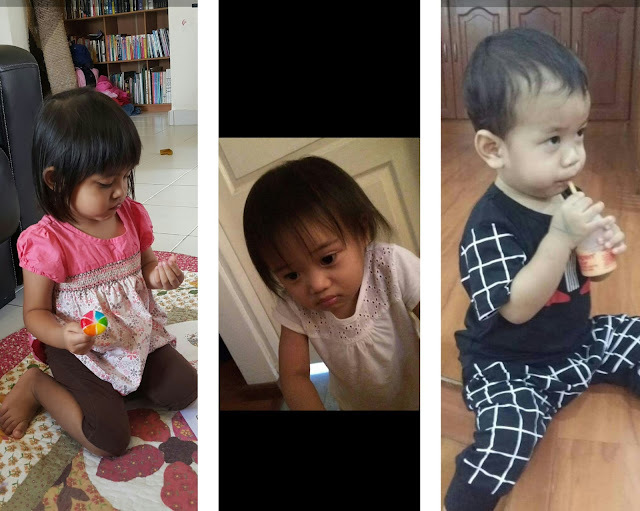 Being an aunty is a wonderful thing because you can enjoy their cuteness but in the same time will still have time of your own, hahaha. Usually I like to play with them but the moment they cry or need to go to the bathroom, I immediately pass them back to their parents :) Smart move right? Once I babysat Chid and Iman, and I brought my laptop with me so that they can watch cartoons. Just in case they are restless and started to cry asking for their mummy. The next morning, I switched on my laptop to start working and guess what, Thomas and Friends theme playing at the background! I wonder what will happen if I had a meeting that morning or even worse, class! Hahaha, they are just so cute and they both dragged me into their cuteness. I had written down 5 salient points that I think an aunty would understand. To Chid, Iman and Airis, please know that the three of you stand tall behind this post. Ok, let's go! 1. You suddenly notice toys left at your home even though you have no children. Ok, after they left, there will be a major cleaning process at our home. I had noticed flashcards of fruits in the past and sometimes notebooks. I remember one of the notebooks very well because Chid asked me to keep it away from her brother. Alas, she forgot to claim it back from me so it was left there sitting on my dresser. We do not have children but sometimes toys are left on the floor not to mention your belongings that they thought are toys and left scattered on the floor, hahaha. They are still so cute though. 2. You find yourselves spending longer time scrolling the photo gallery in your handphone. It's either looking for their pictures or you are trying to find other pictures but then the gallery was full with their pictures. Thus, making it harder to find what you want. I have experienced this so many times. I want to look for a specific picture but I took more than 15 minutes scrolling through my media gallery because there are just thousands of pictures of them. Oh ya, not forgetting some of the pictures that they took using your handphone. They are blurry with no center of attention but you purposely did not delete them to support your nieces and nephews artistic talent. 3. You have a folder dedicated for them in your laptop. Their folders are not only in my laptop but appear to be in my Ipad too. I am an avid user of Dropbox and can you imagine I had created a file just to upload their pictures because my handphone memories are full. It's like they are haunting me or something, hahaha. Sometimes I will tell Mr H that I want to buy something and that something is only located at a place near to my siblings house. Once we are there, I will find excuses to visit them. Them here referring to my nieces and nephew, NOT my siblings, hahaha.